Originally engineered to solve the problems of relocatable or temporary shelter, tensioned membrane structures are now a sustainable choice for permanent, habitable structures, providing fast, energy-efficient and affordable building solutions. Identify and design the components of a permanent, habitable tensioned membrane structure. Review the sustainability engineered into these monolithic structures including energy efficiency, daylighting, and fire safety. Integrate components such as windows, doors, lobbies, and interior partitions within a self-supporting framed structure all within a system that is designed for the maximum reduction of construction waste and transportation costs. Discuss the flexibility, cost-effectiveness, and durability of these structures. Tensioned membrane buildings provide an opportunity for a new sustainable design approach for any building program that requires column-free and open-span floor plates. New tensioned membrane buildings are sited in deserts as well as snow-covered mountains with segmented grace. These buildings can provide immediate, cost-effective alternatives to conventional construction, for facilities that range from dormitories, churches, and offices, to gymnasiums. Tensioned membrane structures have been around since the 1960s, often used by the military. When oil and gas companies required shelters for both arctic and desert climates that could be easily transported across the world, engineers developed an energy-efficient portable building system. Their solution has been refined and developed into a new building type-permanent, habitable tensioned membrane structures. These buildings can be erected quickly and cost-effectively, maintaining similar performance and aesthetic values to conventional structures, but with a lower cost basis of thirty-five to fifty percent. Architects who have worked with these forms can attest to the difference and quality of these durable, affordable, flexible and energy-efficient buildings. This course will review the aesthetics and attributes of tensioned membrane buildings and provide information on how they can fit into a sustainable design portfolio in any climate, delivering energy efficiency and durability for clients who need affordable and immediate building solutions with an optional insulation package. In the introduction to the Whole Building Design Guide , a program of the National Institute of Building Sciences, Richard Rush is quoted as defining an integrated building system by only four systems: structure, envelope, mechanical and interior. "The envelope has to respond both to natural forces and human values. The natural forces include rain, snow, wind and sun. Human concerns include safety, security, and task success. The envelope provides protection by enclosure and by balancing internal and external environmental forces. To achieve protection it allows for careful control of penetrations. A symbol of the envelope might be a large bubble that would keep the weather out and the interior climate in. "1 Tensioned membrane structures provide many environmental, as well as aesthetic, advantages in an integrated building system. Photo: Sprung Instant Structures, Inc. Permanent and habitable, this structure is an example of a tensioned membrane building. Begun as a mid-twentieth century art movement, biomorphic artists focused on organic shapes inspired by biological forms and processes. Abstract and often surrealistic, these forms expressed an alternative to realism and static, orthogonal objects. One of the most recognized biomorphic artists today is Dale Chihuly, whose glass botanical forms are often inspired by nature as well as inserted in natural landscapes. Biomorphism in architecture has taken many directions as a movement. Architects are studying the design of vaguely organic forms as well as creating new buildings that not only replicate shape but also emulate biological processes. There is a new desire to learn from nature in order to design sustainable buildings. A highly engineered, integrated system, a tensioned membrane structure has an organic, biomorphic form as well as an efficient, technological response to climate and natural processes. Design professionals have new opportunities to explore alternatives to big box construction, within the framework of a sinuously curved, rounded volume. Open, bright and energy-efficient, the Redemption World Outreach Center is used for recreation by the whole community. Architect David Simpson, principal of David M. Simpson Architects in Greenville, South Carolina, continues to be amazed by the aesthetic and massing of the 48,000 square-foot Redemption World Outreach Center, which he designed using a tensioned membrane building. The client had seen a similar project that was constructed in Florida and asked Simpson to see if this might be an affordable solution for their fitness facility. They liked how the membrane-covered frame structure looked as well as the promise of an early completion through this fast, modular construction process. They also liked the resulting bright, clear span, daylit and energy-efficient space. This 120-ft wide by 300-ft long tensioned membrane building is currently being used by the entire community as a fitness center, gymnasium and recreation complex. The structure was delivered in mid-February of 2009 and the facility opened in mid-June of that same year. The monolithic enclosure was installed within a nine-week period not including the slab or footing construction, or the interior skeleton or walls. According to the building contractor, Lynn Wiley of Daystar Construction, "The client wanted a "wow" factor and got it in this unique building. The structure was simple to construct." Church members shared the excitement of watching this unique facility being constructed and often commented on each stage of the process. Most were astonished at the rate at which the building was completed. They are pleased by this comfortable daylit enclosure that is home to their new fitness facility. 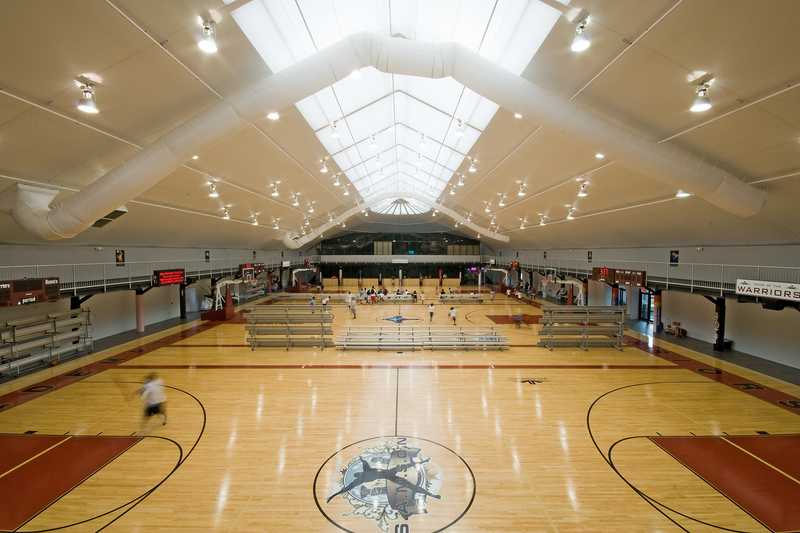 The building houses three full size basketball courts, and each round end of the structure has a 12,000sf mezzanine level with meeting rooms, weight rooms, aerobics rooms, cardiovascular equipment, and locker rooms complete with two separate sauna areas. The perimeter of the structure has a raised, 1/5th-mile running track that overlooks three basketball courts. Lighting, fire suppression, sprinklers and the HVAC systems were either suspended in the structural beams by way of attachment brackets. The brackets are held in place by bolts in an extruded bolt chase. The HVAC system was mounted outside the structure on a platform to avoid a conflict with the running track. An entry addition was added to the building, designed by the architect and attached with input from the manufacturer as to flashing and connection details. Doors and windows connections were supplied by the manufacturer and were installed as part of the structural system. The construction team included a manufacturer's representative who made sure that the installation had minimal disruptions or delays. The envelope is filled with R-30 formaldehyde-free insulation. The two-membrane layer combined with an insulation filling creates an airtight envelope that provides lower energy costs. As with any engineered system, the designer has a set kit of parts that needs to be adapted to the client's program goals. Tensioned membrane buildings can be curved along a two-dimensional spine, or contain the program under a singular, domed shape. The skeletal frames can have either rounded or flat ends. 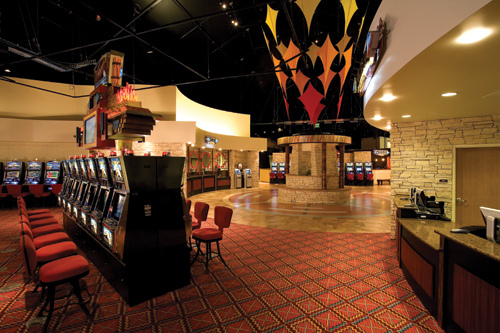 The designer can choose to add windows, doors and external rooms, as shown in the entry canopy and lobby for the Navajo Fire Rock Casino. These structures can also become additions to existing buildings with a sealed connecting corridor system. These corridors can range in size in width from ten to nineteen feet. The advantages of a tall, vaulted and column-free structure is that the design professional can work within a flexible, open interior volume to insert an independent system of walls, mezzanines, entries, etc. Membrane buildings are a new place for art. The surfaces of these buildings create a new and expressive design opportunity to develop surface designs, patterns and symbols. 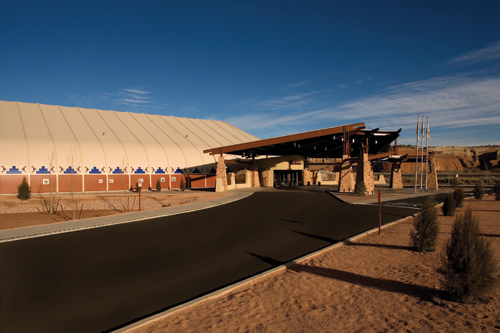 In choosing a tensioned membrane structure for Navajo Fire Rock Casino in New Mexico, the client selected this form for the speed of construction. They soon realized the aesthetics and quality of this building also met their vision for a permanent structure. The tribe chose to imprint Native American symbols on the canvas of their building membrane, an aesthetic reference to the tents that once marked Indian settlements. This New Mexico tensioned membrane casino is designed for the desert and references the art forms of its Native American owners. Photos: Sprung Instant Structures, Inc. Dramatic, interior spaces in this casino are designed to be independent of the structural form.